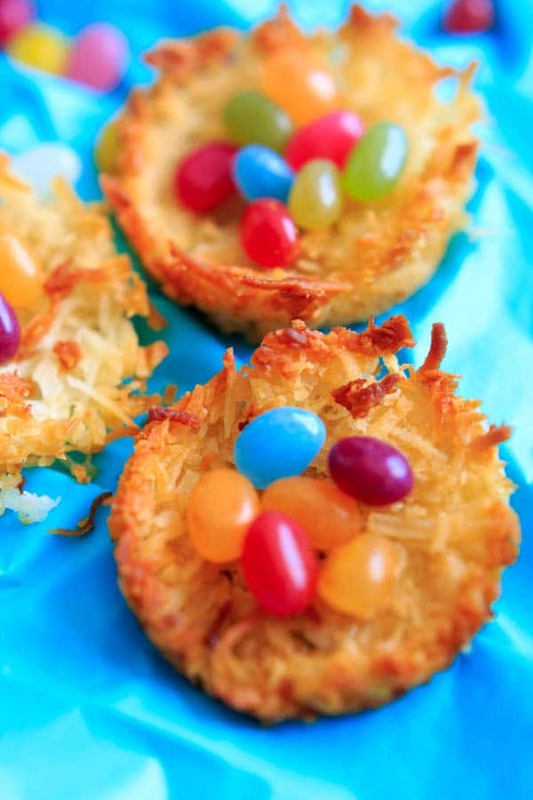 Coconut Macaroon Nests – fill with your favorite candy, or use jelly beans or Easter eggs for a fun holiday treat. 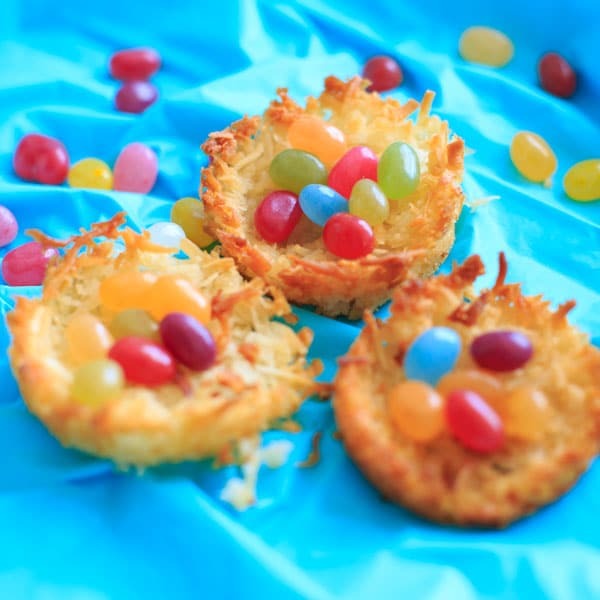 Easter is right around the corner so when I saw these coconut nests from SkinnyTaste I couldn’t resist trying them. Really though, it was just an excuse to buy jelly beans. I intended to buy chocolate eggs as that is the candy featured in the original recipe, but I couldn’t resist the “gourmet jelly bean” bag as I passed it in Trader Joe’s. I think at least 50% of my purchases at that store are impulse buys and I don’t think I’m alone. Must learn their marketing secrets. From my experience, there are two types of jelly bean eaters. Luckily with this brand I like all the flavors – well, except the licorice – but at least I don’t have to worry about getting a weird buttered popcorn flavor mixed in and ruin it all. Technically I guess there’s a third type, people who don’t like jelly beans at all. So for you guys, you can pick your favorite candy to throw in these nests. Maybe get those chocolate eggs I meant to get. Or I’m sure there will be another impulse option near checkout if you go to Trader Joe’s. I made these in a regular muffin pan, though if you have a mini-muffin pan they’d be even cuter. Or you can just put a dollop on the pan and press them down like a thumbprint cookie before you bake. 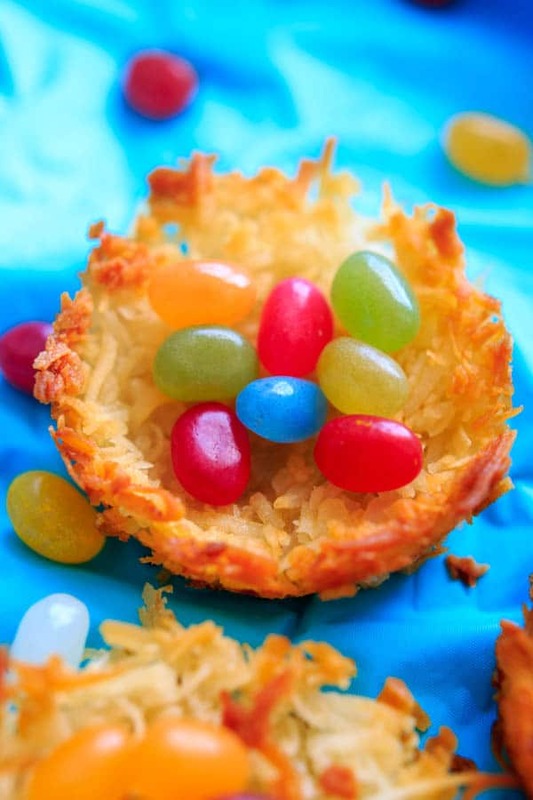 Coconut Macaroon Nests - fill with your favorite candy, or use jelly beans or Easter eggs for a fun holiday treat. In a medium bowl, mix together egg whites, sugar and coconut flakes together. Spray a muffin pan with oil to prevent sticking. Add a heaping tablespoon of coconut mixture into each tin and use the back of the spoon press mixture in and make the nests. 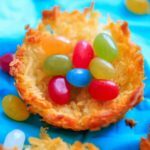 Once cooled, fill with jelly beans or other candy as desired. These are absolutely adorable and perfect for Easter! And I’m the same way about Trader Joe’s… I always buy things I most definitely don’t need haha! They have a way of getting us to do that don’t they! These are so adorable Kelly! And I’m with you & Valentina, Trader Joe’s definitely causes me to buy much more than was ever on my list – but it sure is good! Love that you found a way to save some time in making these – that is always a plus. These are too adorable!! Love this idea!